the adventures of tartanscot™: "The Colours of the Ocean . . . "
Peaceful, yet layered. Something I think is difficult to achieve. Smith is so talented. His combination of textures and styles is spot-on. This particular project is quite calming. 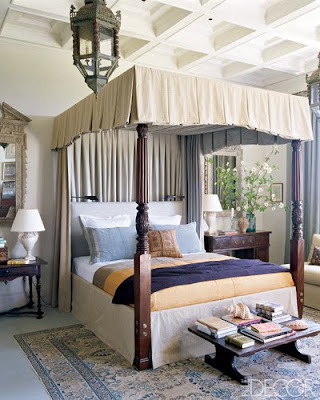 If I climbed into that bed, I'd never want to get out.
. . . and I love a beautifully coffered ceiling as well. So many people think that "beachy" means all blue and beige with a few seashells tossed around. I love that Smith recognized the nuanced palette of the ocean. Even his use of classic colors like blue has such a great range, from the muddiness of water mixed with sand to clear blue sky. Definitely swoon-worthy.